The Unified European currency has significantly dropped in price against the American dollar at Thursday’s trades. The losses have exceeded 100 points. 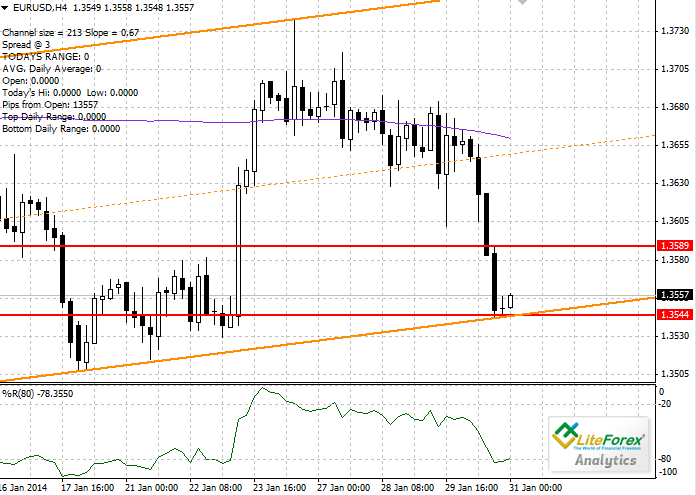 At the moment Euro has reached the bottom limit of the trading channel at the level of 1.3541. Starting from this level the pair may experience technical correction. In general, Euro is still under pressure and is likely to continue decline. The fall in the pair EUR/USD is mainly caused by the decision of the US fed to continue reduction of the stimulus programs. However, until unemployment rate does not go below the key level of 6.5%, Federal Reserve will maintain low interest rate in the range of 0-0.25%. Today, unemployment rate in EU will become known, which is expected to remain unchanged (12.1%), as well as harmonized consumer price index (forecast – 0.9%). However, this data can hardly change force balance in the market or support Euro versus the USD. In addition, there are signs of inflation in Eurozone: Indicator of money supply in December fell to 1%. Growth of deflation can result in more aggressive monetary policy of the ECB in order to stimulate economic growth. The nearest resistance level is the highs of December at the level of 1.3589. Support level for the pair is the local lows of 1.3544. It is recommended to open short positions after breakdown of the level of 1.3544 with protective orders near the level of 1.3570 with the target of 1.3442.